Five world powers have agreed with Iran to establish a financial facility in the European Union to facilitate payments for Iran’s exports, including oil, as well as its imports. It is a key move sought by Tehran following the U.S. pullout from the 2015 nuclear deal and its re-imposition of sanctions. European Union foreign policy chief Federica Mogherini told reporters after the closed-door ministerial meeting that the financial facility is also aimed at preserving the nuclear agreement that is aimed at preventing Iran from developing nuclear weapon. The council issued a statement Monday emphasizing that perpetrators and sponsors of the assault need to be held accountable. Militants disguised as soldiers fired on marching troops and onlookers at a parade Saturday in the southern Iranian city of Ahvaz. Blamed on Arab separatists in the region, the bloodshed marked the deadliest attack in Iran in nearly a decade. It further racheted up tensions across the Persian Gulf ahead of the U.N. General Assembly meeting of world leaders, which began Monday. Thousands of Iranians attended a mass funeral service Monday for the attack victims. The United States has announced $185 million in new humanitarian assistance for Rohingya Muslims displaced by a military crackdown in Myanmar. Foreign ministers from more than a dozen countries met behind closed doors Monday to discuss the plight of the Rohingya and a recent U.N. fact finding report into atrocities in Myanmar’s Rakhine State that recommended prosecution of military leaders for genocide. U.S. Ambassador Nikki Haley says the new U.S. aid will go mostly to Rohingya refugees in neighboring Bangladesh. She says it brings total American assistance to $389 million since the crackdown began in August 2017. German Foreign Minister Heiko Maas says his country wants to use its upcoming term on the U.N. Security Council to address conflicts around the world before they become full-blown crises. Speaking Monday ahead of his trip to the U.N. General Assembly, he said Germany will emphasize a strong United Nations and “multilateral solutions” — an indirect swipe at the go-it-alone policies of major powers such as the United States. Germany takes up its two-year, non-permanent seat on the council in 2019. Maas called climate change the central challenge of the 21st century, citing the destabilizing effect it can have on entire regions. He said the Security Council needs better information about climate change to tackle the issue. The head of NATO will meet in New York this week with Russia’s foreign minister amid tensions over alleged Russian meddling abroad and NATO activity near Russia’s borders. The meeting with NATO Secretary-General Jens Stoltenberg will take place on the sidelines of the U.N. General Assembly, according to Leonid Slutsky, head of the Russian lower house of parliament’s foreign affairs committee. Slutsky told The Associated Press that the Russian delegation at the U.N. will express concern about Western support for Russia’s neighbors, and call for better communication around Syria’s war. NATO has expressed concern about alleged Russian interference to thwart Macedonia’s efforts to join the alliance. Slutsky said the Russian delegation will also meet with EU foreign policy chief Federica Mogherini, after the EU extended sanctions this month against senior Russian officials accused of meddling in Ukraine. Slutsky has been targeted by U.S. and EU sanctions. Iran’s President Hassan Rouhani has announced his nation’s “ever-more-resolute decision” to fight against all forms of terrorism following a weekend attack targeting a military parade that killed at least 25 people. Thousands of Iranians attended a mass funeral service in the southwestern city of Ahvaz Monday for the victims. Iranian officials have blamed the U.S. and its regional allies for backing the Arab separatists, who carried out the assault while disguised in military uniforms. U.N. officials and world leaders are looking to Nelson Mandela’s legacy of championing peace, human rights and global cooperation as the U.N. General Assembly’s annual top-level meeting begins. At a peace summit Monday honoring Mandela, General Assembly President Maria Fernanda Espinosa Garces said the late South African leader “represents a light of hope for a world still torn apart by conflicts and suffering” at a time of doubt about the prospect of international action to address them. The Assembly adopted a declaration vowing to redouble “efforts to build a just, peaceful, prosperous, inclusive and fair world” in Mandela’s spirit. A statue of him was unveiled at U.N. headquarters. Top Western and Arab diplomats are discussing Libya’s latest violence as France tries to salvage a plan for long-awaited Libyan elections in December. French Foreign Minister Jean-Yves Le Drian is hosting Monday’s meeting in New York on the sidelines of the U.N. General Assembly. He wants Libya to follow through with a plan agreed in Paris in May to hold elections Dec. 10. The U.S., Italy and some other key players think that is too soon. Speaking to reporters, Le Drian criticized those in Libya “who want to preserve the status quo for their own benefit,” notably to profit from today’s violence and lawlessness to embezzle oil. Monday’s meeting comes as more than 100 people have been killed in the capital Tripoli in recent weeks in attacks by rival militias. Libya slid into chaos after a 2011 uprising and NATO intervention that helped oust longtime strongman Moammar Gadhafi. France’s foreign minister wants the U.N. to rally behind a Russian-Turkish accord averting a massive battle for the Syrian rebel stronghold of Idlib. Foreign Minister Jean-Yves Le Drian said Monday that the accord is “a good thing” and an “opportunity to seize,” despite concerns that it may not work. Speaking ahead of the U.N. General Assembly in New York, Le Drian said France supports a push for a U.N. resolution backing the Idlib accord. However, he wants to add conditions to link the agreement to a longer term peace process. Russia and Turkey reached an agreement last week for a buffer zone and cease fire around Idlib. Russia supports Syrian government forces and Turkey has leverage with opposition fighters. U.N. Secretary-General Antonio Guterres says the global drug problem is “alarming,” with some 31 million people around the world requiring treatment and some 450,000 deaths every year from overdoses or drug-related health issues. 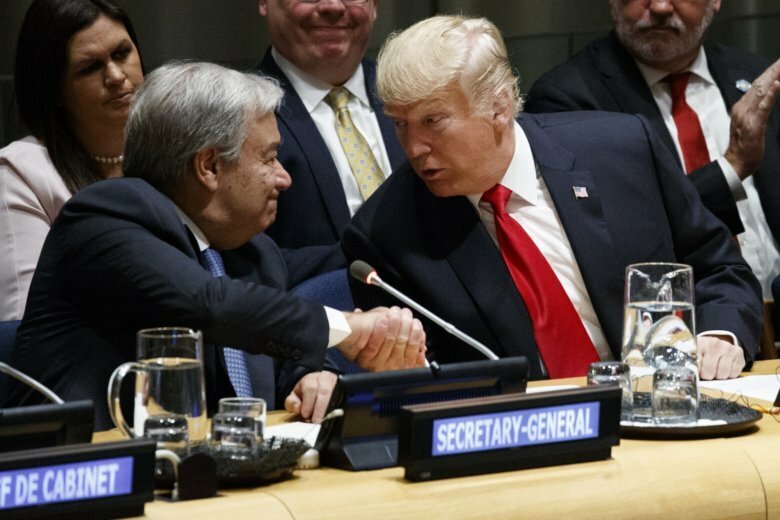 The U.N. chief told a meeting at U.N. headquarters in New York hosted by U.S. President Donald Trump that a global spotlight on “this life-and-death issue” is needed now more than ever. Trump said global drug use has gone up 60 percent from the year 2000 to 2015. He said he was “thrilled” that some 130 countries have signed on to a U.S. call for action to reduce drug demand, cut off supplies, expand treatment and strengthen international cooperation.